Only one painting has ever brought me to tears. During an early visit to The J. Paul Getty Museum in Los Angeles, I stood in the entrance to works of 19 th century artists. Across the room I spotted it … a composition of magnificent blue and green flowers. I couldn’t turn my eyes away while being drawn closer and closer as the painting became better with each step. I stopped four feet away and marveled at the image while tears began running down my face. Fortunately, I carry a handkerchief and covertly mopped up before I too became an art spectacle. The moment became personally more significant when I realized the painting was “Irises” by Vincent van Gogh. I had seen a few Van Gogh paintings before and have viewed nearly all his images available in books or online, but until then I had never seen one that I truly admired. Yet this painting hit me with such force I was weeping. Was it a one-time occurrence? No! It happens whenever I return. Each time I wonder in awe how this could be painted in 1889 by a depressed, mentally unstable individual in an asylum one year before committing suicide. Near this masterpiece I feel joy, peace, and immense appreciation. There is no sense of tension. I later discovered this was van Gogh’s first painting in the Saint-Remy asylum. Perhaps he too finally felt at peace. I’ve thought hard and considered the many possible explanations for my repeated reaction, but I have nothing absolute. Is it the colors, the composition, the bold execution with contrast, texture, shapes, edges, lines, or all the above? Is it something far more esoteric like an actual connection with the thinking of Van Gogh? How can one painting stand so far above all others? I was hoping to learn more last month on a trip which included a Viking Cruise along the Rhine River leaving Amsterdam on September 20 th and arriving in Basel, Switzerland on the 27 th . My wife Ellie had planned the entire vacation allowing an extra week in Amsterdam where we stayed in the small Van Gogh Hotel directly across the street from the Van Gogh Museum containing the world’s largest collection. And only a block or so down the street is the Rijksmuseum with 6000 paintings including those by Rembrandt, Frans Hals, and Johannes Vermeer. After nearly two full days in both museums seeing some of the world’s greatest art, I’m back at square one. 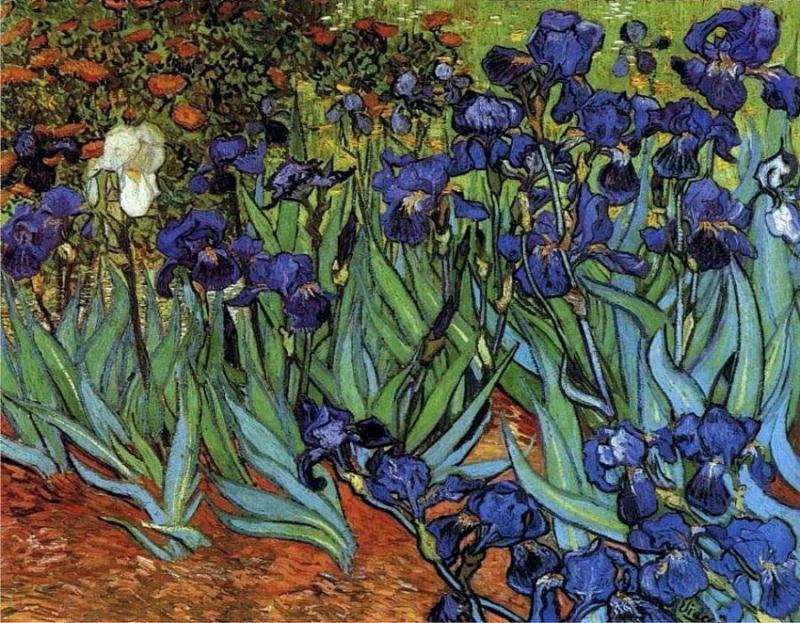 Only one painting makes me cry … “Irises”, yet I still am not moved by any other Van Gogh painting. While on our cruise we also visited many incredible cathedrals, another art form often requiring the work of thousands of men for hundreds of years. But, like Van Gogh’s “Irises” only one cathedral spiritually set me on fire. The Cologne Cathedral began construction in 1248, took 632 years to complete, and is now the largest Gothic church in northern Europe. More importantly, it contains the Tomb of the Three Kings which holds the remains of the Biblical Magi and sits behind the high altar. Being a well-prepared artist, I had my 60X optical zoom camera trying to get the best shot of the golden gilded sarcophagus. I awkwardly leaned over a railing while inserting my fully extended camera lens between protective metal bars to get an unobstructed picture of this holy shrine. While taking a few shots I began to smell something burning. I looked down and realized it was me! I had leaned over the rack of 50 lit votive candles and my vinyl jacket was melting. I was about to sample Hell right there in the cathedral … one confirmed idiot next to three wise men. I quickly put myself out and left the holy grounds leaving a burning odor not even another idiot would mistake for frankincense or myrrh. One final thought on the power of art with emphasis now on the performing arts. We all have our favorite songs, but are there any which affect us so strongly they bring tears with every play? For me that song is “Into the Mystic” by Van Morrison as released in 1970. The words are thought-provoking poetry describing a spiritual pilgrimage. The lyrics are accompanied by a slow, smooth rhythm sung with inspiration by Van Morrison. I heard it once again at a wedding last weekend and pulled out my handkerchief. Guess I’m getting soft as I get older and appreciate the many forms of art even more. P.S. I thank many of you for your kind comments after last month’s newsletter “In Honor of Ron Adkins.” They meant a lot to Ron’s wife. We are now beginning the process of loading Ron’s images onto Fine Art America for sale as print-on-demand editions.